Click on the cover art above to download your free copy. 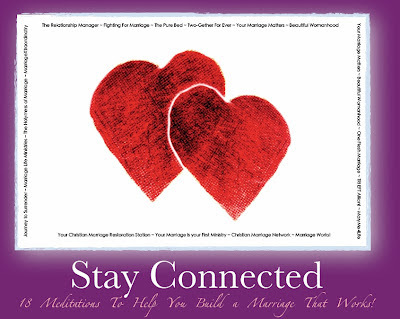 In honor of National Marriage Week, our friends at MarriageWorks have put together a FREE ebook of marriage encouragement and inspiration entitled, "Stay Connected." I'm proud to be among the 18 contributing authors for this great resource. I hope you'll read my page 4 article entitled "What If" and let me know what you think! Also be sure to check out my Facebook Page, where I'm posting lots of cool stuff all week long in honor of National Marriage Week that speaks to the importance of marriage in our society today. Lastly, click on over to the National Marriage Week website and see what the global celebration of marriage is all about and how you can help. From February 7th to 14th every year— is a collaborative effort to encourage many diverse groups to strengthen individual marriages, reduce the divorce rate, and build a stronger marriage culture, which in turn helps curtail poverty and benefits children. Together we can make more impact than working alone. Please join with others to host special events, launch a marriage class or home group, or place local advertising or news stories during National Marriage Week USA.